Just when I was getting used to writing 2009 on my checks, somebody ups and changes the year! 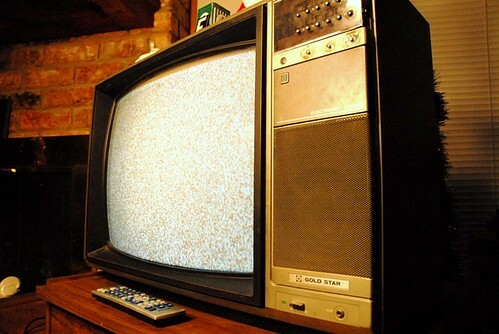 A lot of things happened in 2009, but the most important, life-changing event that occurred has to be "The Big Switch" -- the change from free analog television over the airways, to a crappy "you must purchase a converter box and enormous tower or you'll never see ABC again" digital signal that I STILL don't get. Yes, friends and neighbors, I got the converter boxes and they didn't work. I bought a new set of rabbit ears for my old TV, and THEY didn't work. My children have a digital television that was supposed to be able to get the all-powerful, all-wonderful new digital signal, and even THAT didn't work. And do you want to know why? Location, Location, Location! We live in a hole by the lake. Okay, we live in a house, not a hole, but it's in a depressed area. Okay, the area's not that depressed because we have happy grass and trees, but it's low-lying -- so low that those zippy new digital signals just pass overhead. And since the only way I'm going to catch those signals is by building a tower or subscribing to a satellite service, I say let them zoom right on by, thank you very much! Why should I pay mucho dollars to subscribe to a service that puts out 250 channels of high quality goat poop, when I can spend my time doing a lot more important things like feeding my goats and practicing banjo so people won't cringe whenever they hear me play? Anyways, Happy New Year. I missed the Rockin' New Year's Eve parties on ABC, but I'm sure you'll tell me all about them!